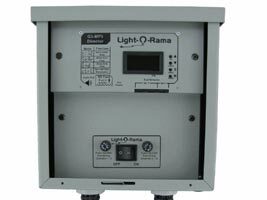 The LOR1602Wg3-MP3 is a 16 channel weather resistant light controller with a built in G3-MP3 Director. Each of the 16 independent channels has a number of special effects such as dimming, ramping, twinkle and shimmer. The LOR1602Wg3-MP3 is built in a weather resistant case allowing it to be used for your outdoor displays. The built in G3-MP3 Director is a compact, powerful Light-O-Rama Show Director with a MP3 Player that is designed to take the place of your PC. It directs one or two high speed networks of Light-O-Rama controllers while simultaneously playing MP3 audio files. The on-board real-time clock with power-fail back can be used to schedule shows. Six trigger inputs allow shows to be started by external events, usually momentary switches and/or motion detectors. The G3-MP3 Director is a leap ahead of the DC-MP3-SHOWTIME director that is replaces. The two networks can run up to 500K which allows this director to control up to 8000 channels making this director a great match for the pixel based Light-O-Rama Cosmic Color devices. The G3-MP3 Director is backwards compatible with earlier directors thus shows made for those directors can be plugged in with no changes. Includes a 1Gb (or larger) SD card and a USB card reader to transfer shows from your PC to the SD card.